We invite you to explore Summerset Trail either by bicycle or on foot. You’ll find an enjoyable trail that passes through prairie, wetlands, woodlands and along the Middle River southwest of Carlisle. Enjoy nature, wildlife, fitness and family fun! Summerset Trail is 11 miles long and is paved with asphalt. It is a “rail Trail” having been built on the route of an abandoned railroad line between Carlisle at it’s northeast end and Indianola at the southwest end. The Summerset Trail is a “National Recreation Trail (NRT). The trailhead at Carlisle provides parking, portable toilets, and a shelter and picnic area. There is access to a Casey’s store and Fiss’ where you can enjoy ice cream, subs, sandwiches and salads. Riding south, from the Carlisle trailhead, the northern section of the trail has virtually no variation in elevation and features opportunities to observe birds and a variety of wildlife, especially as you pass through the wetlands conservation areas. The trail turns south where it crosses the Middle River Bridge and begins a gradual uphill climb. There is a trailhead about halfway at Summerset State Park and riders can enjoy the park road as it loops around Banner Lakes. The trailhead has parking, portable toilets and is accessible from Hwy 65/69. 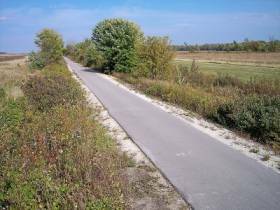 South of the Middle River, the path and terrain turns into gently rolling hills through prairie remnants and ends at the Indianola trailhead in the 300 block of East 5th St.. This is also the junction with the 1.6 mile long Mc Vay Trail which ends at Pickard Park in Indianola.